On paper, the premise for Tag sounds ridiculous and silly, about a group of middle aged men playing a long running game of tag, which could have relied on cheap laughs throughout the film. 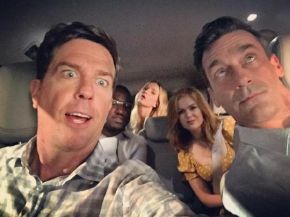 However thanks to the great comedic performances and chemistry between it’s cast, the film surprisingly works as a fun and entertaining comedy. Based on a true story, the film follows a group of childhood friends who have been playing the same game of tag for thirty years. Their game runs through the month of May every year, where the last person who was it, has to tag someone else in their group, often going to extreme lengths to do so. When undefeated player Jerry (Jeremy Renner), is set to retire from the game following his wedding, the rest of the group decide that it is only right to tag their friend once and for all. This film could have been hit and miss given its premise and tone of the film, and whilst Tag is far from becoming a comedic classic, there is enough there to keep you entertained and laughing throughout. The lengths that each of them go to just to tag someone is so over the top yet hilarious, especially when you know that they’re playing a childhood game. From disguising themselves as a janitor at their workplace to hiding in on therapy sessions, each scenario is as funny as the next. Whenever the group try to corner Jerry in order to tag him, the tone quickly shifts from a goofy comedy into an action-thriller as we hear a voiceover from Jerry, as he works out his friends moves and tricks against him. He treats the game like a hunting operation, which plays out so brilliantly thanks to Renner’s athletic skills and numerous traps to remain one step ahead of them. This is best shown where the group try to corner Jerry after his rehearsal dinner, as they chase him into the woods where he has a number of traps set up to take his friends down. The whole scene works so brilliantly, as you’re initially unsure of what will happen next, but quickly has you laughing once you see each one haplessly fall into Jerry’s traps despite their efforts to catch him. The chemistry between the main actors are one of the highlights of the film, thanks to their brilliant comedic timing and the way they work off each other. You have so much fun watching their wild antics, however there are a couple of heartfelt moments between the group that leaves you feeling moved by their friendship. The one let down in the film was Annabelle Wallis’ role as Wall Street journalist Rebecca, which was underwhelming and rather pointless. Yes the film was based off an article in the Wall Street Journal but the subplot of her following the group around was unnecessary. Wallis is supposedly meant to be the straight woman to the antics around her, but she wasn’t given much to do, asides from stand there and occasionally ask questions, and you’d forget that she was there most of the time. It was great to see actors usually known for their dramatic work such as Jon Hamm and Jeremy Renner, show off their comic chops for this film. At times they do display a serious manner to their character, yet they bring out a goofy yet highly funny side to them, making it fun to see them play against type of their usual roles. However, it was Isla Fisher’s role as Hoagie’s competitive wife, that was the main standout amongst the cast. Fisher steals every scene she’s in, with her brash personality and competitiveness that has you in stitches over her competitive antics and brilliant one-liners. Tag is filled with goofy fun, that will keep you entertained throughout. Purple Revolver Rating: 4/5 - goofy yet entertaining.